One of the most rewarding parts of our work is being able to introduce a plant we’ve taken from idea (branched flower scapes) to reality. We are finally able to share our latest creation this week with the introduction of Hosta ‘Branching Out’. The first cross in the long road from creation to market took place here in 1989. A seedling was selected that was later crossed with another 1995 seedling, which was later crossed with a 1999 seedling, which in 2004 was crossed with the blue-leaved Hosta ‘Pewterware’, after we noticed that both hostas would occasionally produce a single-branched flower scape. We evaluated the resulting 2004 seedlings for several years before paring down their numbers in the semi-final cut. We were looking for good branching, attractive flowers, and sturdy stems. Once the final selection was made, we watched it for four more years to make sure it consistently branched in the garden, during which time, we also sent it north to evaluate its performance in colder climates. Not wanting to significantly disturb the main clump, we removed a single division in 2012, which was divided annually. Finally, in 2016, we are pleased to release our new baby to gardeners around the world. We hope you find this as exciting in your garden as we do in ours. This entry was posted in Plant images from the garden and nursery and tagged Breeding, Hosta by Plant Delights Nursery. Bookmark the permalink. It’s always interesting to read your articles and descriptions . …. Was my mantra at one time ! That is incredible! Thanks for all your hard work and dedication to create this new breed. keen observation , sometimes luck, I prefer observation, will inspire devlelopement of new concepts , ideas designs of plants. I have a hydrangea that has shorter internodes than the original. Unfortunately , the original is certainly patented, so I can only propagate for personal planting.. It resulted in a more compact plant with apparent lager flowers. Now that I have patted myself on the back, I congratulate and praise your hard and drawn out work. Mutations found on patented plants are not protected…unless you had the plants under a signed trial/production agreement. The only exception would be if the breeder also had a utility patent, which is extremely rare in plants. After sending the previous email, I have had second thoughts about abandoning a breeding line of Euphorbia millii where I have trying to intensify a reddish purple underside of the leaf. It is not yet a true mature trait, fading to green when the seedling fairly large. I also need to fix a larger contrasting flower. A totally red leaf would be nice . Will it oblige? Jerry – Purple/red pigmentation is due to anthocyanin production. Most plants have a switch that tells the plant to reduce anthocyanin production in the hot months. To find a seedling with the switch installed backward is possible, but rare, so it’s a numbers game…the more you grow, the better chance of finding the desired mutation. A classic example is Prunus ‘Canada Red’. The leaves emerge green and darken to purple as it gets hotter. Great question. We made quite a few different crosses toward this goal, and indeed many could not support the weight of the extra flowers. 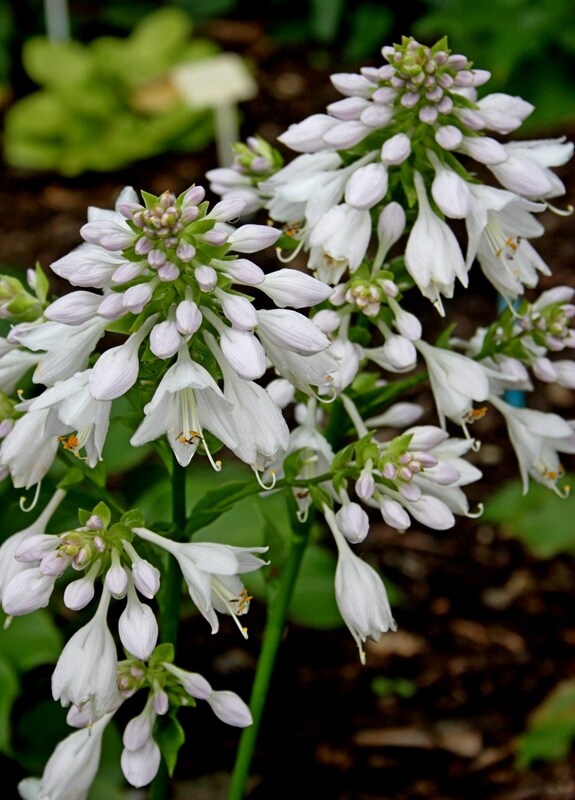 Hosta ‘Branching Out’, however, has incredibly sturdy flowers, that hold the flowers completely upright. Congratulations . There were many steps taken and five different varieties of hostas were married . It is a wonderful story. Would you please tell me the names of the individual variety that was used in each step. I am a guide in a botanical garden in Vancouver and I would like to recount this nice story to the people who visit our garden when I show them all of the different hostas ithat come and go from March through November. thanks. I’ll try and post this as time permits. Sorry for the delay. Do you have a specific question? I would like to know if overhead watering is NOT advised for Hostas. My plants are in part sun/shade and i think the wet leaves rot a little. The plants are new to the spot. Overhead watering is fine…if not, we’d better figure a way to stop the rain. Be sure, howwever, if you use a hose that your run out the scalding water inside the hose if it’s been exposed to the sun before you apply it to the foliage. If not, it will scald the leaves, resulting in the rot you described. Otherwise, you should be fine.